The past few months have been busy ones for Thales. During Aircraft Interiors Hamburg the company announced the expansion of their IFEC portfolio with the introduction of CORE and PRESTIGE inflight entertainment. The two products offer differing degrees of experience for airline passengers, depending on the airline’s objectives for providing inflight entertainment. As the name suggests, CORE is an IFE solution designed to provide the airline with value and competitive cost of ownership in conjunction with Thales support services and is configured on existing architecture that has been qualified and tested. CORE is PCI compliant and enables ancillary revenue opportunities for the airline operator. The system has upgrade options and is capable of providing connectivity if so desired by the airline. One of the major benefits of CORE is the accelerated delivery process, while still providing a streamlined configuration and effective solution to onboard entertainment. The user interface is designed with latest UX technology and has been dubbed “Select” by Thales. Select interface enables the airline to provide their customers with mixed content and integrated advertising that can include promotions, targeted offers and destination content. CORE is line fit offerable on all Boeing and Airbus platforms and cybersecured by Thales. Whereas, PRESTIGE is a multi-dimensional and personalized experience for the passenger that is tailored to enhance the airline brand with a unique user interface. This product is specifically targeted for the airline that is looking to provide their customers with an exclusive experience in flight. The system is designed to enable passengers to connect, engage and experience their flight with the latest PEDs and unique connected apps. The company states that PRESTIGE will feature ultra HD (4K) displays. Thales told IFExpress that the system is lightweight, has low power draw and is very reliable. The objective of PRESTIGE is to enhance the passenger engagement, personalization and monetization by building a more intimate relationship with the traveler throughout their journey. They also stated that this is achieved through a robust co-innovation process and diverse industry partnerships via their Thales Digital Factories and location innovation centers. The user interface for the product will be unique for each customer and developed by a dedicated UX Center of Excellence and best-in-class agency partners. The UI will be commissioned by the airline and crafted to elevate their brand. 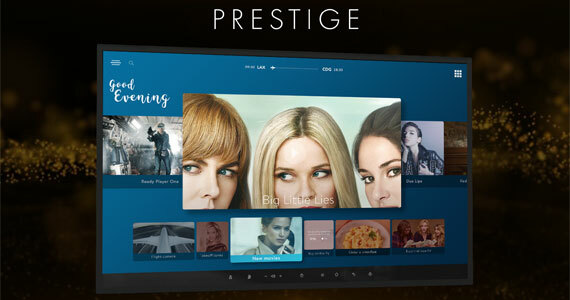 PRESTIGE is targeted for the airline who wants to provide their passengers with an exclusive experience that extends beyond the IFE system. Both CORE and PRESTIGE systems are powered by Thales’ InFlyt360 digital platform, which incorporate the latest Big Data technologies – think machine learning and matching algorithms – that continuously optimize the inflight experience for both the passenger and the airline. InFlyt360 continuously optimizes the passenger experience providing airlines a complete IFE ecosystem customizable to their business goals. There are four (4) key features to InFlyt360 Personalization, Monetization, Fresh & Dynamic Content and Optimization. Thales firmly believes that the InFlyt360 platform will open new possibilities for brand differentiation, passenger engagement, increased exposure and the ability to provide new revenue generation opportunities for the airlines. Spirit Airlines, a leading carrier in the U.S., Latin America and the Caribbean with more than 550 daily flights to 65 destinations, has a clear strategic vision to transform the overall guest experience on the ground and in the air. To help achieve this big ambition, Spirit will rely on Thales to launch FlytLIVE, the next generation connectivity experience, supporting their mission of customer choice and operational excellence. Through the signing of today’s agreement, Spirit and Thales are partnering every step of the way to bring the most advanced Ka-band High-Throughput connectivity solution optimized for commercial aviation to the aircraft. FlytLIVE services will use SES and Hughes next-generation aviation satellite network and technology to provide the airline unmatched performance, ultra-high speeds and redundancy. With FlytLIVE, Spirit’s guests will enjoy full Internet services including video streaming, games and social media for an engaging experience in the air. Spirit is the first U.S. based airline to select FlytLIVE by Thales. The all-Airbus fleet of A319, A320 and A321 aircraft is the youngest fleet of any major U.S. airline. All aircraft will be equipped with FlytLIVE by Thales, a simple, seamless and secure connectivity solution providing an exceptional passenger and airline experience. The first aircraft are scheduled to enter into service by the end of 2018, with the entire fleet operating with FlytLIVE by summer 2019. Together, Spirit and Thales will collaborate on optional products and services giving customers the flexibility to choose only the options they value. FlytLIVE is capable of creating innovative revenue generation and advertising opportunities for the airline. The Thales offering also provides bandwidth and session management, operational support tools, maintenance, service and support with the highest Service Level Agreements; leveraging Thales leading digital and cybersecurity expertise. If there is one connectivity related subject you should watch it is the aftermarket service and support organizations Boeing and Airbus (and other plane vendors) have started to work with. They are leveraging outside manufacturers and others to increase customer involvement, build future marketing efforts, and increase the expansion of their businesses … its the future of the connectivity part of the model. We won’t tell the whole story here because it is just now being written and IFEC companies better stay aware. This is “THE” big collaboration and integration deal so watch for the future of many of aviation businesses, outside industry companies, and others in the IFE/connectivity aftermarket: … by “eliminating the immense costs and hurdles commonly associated with acquisition, installation and operation of data-access infrastructure by streamlining system integration and certification,” – Inside MRO broke the aftermarket business cooperation code. The interesting part in all this for our readers is to see the resulting impact on IFEC companies and how they will respond. These technologies include cybersecurity, AI, Big Data, and analytics – just to name a few. Probably, business acquisition and new business strategies will be the future outcome. If collaboration is the new “name of the connectivity game,” then truly, that will result in reduced future costs and better use of the increased data. Watch this one and be sure to check out next week’s IFExpress for more. The AEEC Meeting Agenda (April 23-25, 2018, in Dallas, Texas) is here – AEEC General Session | SAE ITC Checkout it out. A number of subjects caught our eye – “Big Data – An Introduction”, “Long-Range Communication”, “Aircraft Connectivity”- just to add a few! As part of the future of aviation connectivity you should watch GE Aviation as they have acquired part of Avionica in a joint ventured effort to provide wireless data collection/processing for aircraft with connectivity to the ground.